The old saying is proven wrong with the Disney credit card. Being the frugal ninja that I am, I always look for ways to save or make money. I found this offer that seemed too good to be true. 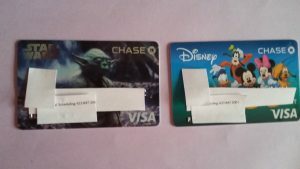 If you get a Disney/Chase visa card, you get a $50 gift card for adding someone to your account and another $250 gift card if you charge $500 in the first 3 months. They also offered no interest for a year for balance transfers. Just a disclaimer that this offer may not be valid for everyone so check first. My husband got the Disney card and added me to the account so we earned the $50 gift card right away. Then we transferred our balances from our other cards. No more interest charges for a year. Then we used the card to pay for every purchase. Didn’t take long to spend the $500. I talked to Chase today and they sent notice to Disney to send me my gift cards. We should have them in a week or less. Super easy! $250 free to spend at Disney. And the cards are super cute. But wait, there’s more! We got an offer from Chase bank directly for $300 if we opened a checking account. We had been looking to leave our credit union because the nearest branch was too far away. Chase is in walking distance from our house. So, we jumped on it, opened the account, and have already been credited the $300. We learned that they have teenager accounts that allows teens to have their own account and debit card. They can’t withdraw more than they have in the bank. It is a great way to teach them responsibility. My son turned thirteen on the 30th. He was so excited to open his own account and get his card. Since cash seems to burn a hole in his pocket, we are hoping he might save more if he just has the card.These savings are all going towards our trip. We are so excited. For more information,click this link. I am not affiliated in any way and don’t get anything at all for the referral. I am just spreading the word to my little ninjas on how to save some dough. UPDATE: Holy moly! We already got our gift cards in the mail! I think I requested them Thursday or Friday night and they are here on Monday. Super fast service Disney! You always find good deals! 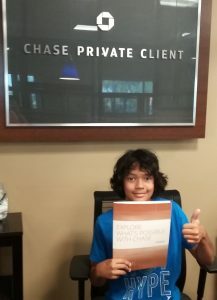 And Chase can’t possibly be 13… it’s NOT possible. No. I’m in denial. It also means I forgot his birthday while wallowing in my own self pity–and for that, I am so sorry. I intend to make up for it! When we moved to PA we got $300 for opening an account at PNC and right now there are two different banks in my neighborhood offering free cash for opening an account and doing something. One requires making three signature purchases in 30 days (I can do that) and the other requires direct deposits totally $500 in 30 days. Not sure I want to move my direct deposit, but I’ll probably take advantage of the other one just for free cash. Then the money can sit there until Christmas and be mostly forgotten.